Still looking to buy a plane ticket this Christmas, but worried that you are going to get slammed on rising airfares? Fear not, we have you covered. Whether you are traveling home for the holidays or looking for a last minute getaway, new research from Fly.com has helped identify a number of flights that will actually help you SAVE money on holiday airfare compared to last year. And no, we are not kidding. 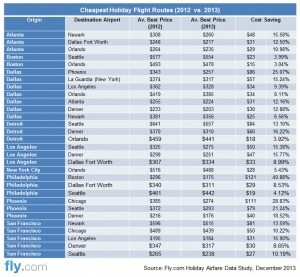 Of the 124 popular routes that we reviewed, a staggering 44 percent are cheaper than 2012 prices. In fact some roundtrip tickets cost over $100 less this year. However some parts of the U.S. offer more opportunity for airfare savings than others. Travelers flying out of San Francisco and Phoenix can reap average savings of $57.25, and airfares from Dallas are as much as $86 cheaper than average 2012 pricing for the same holiday travel period. 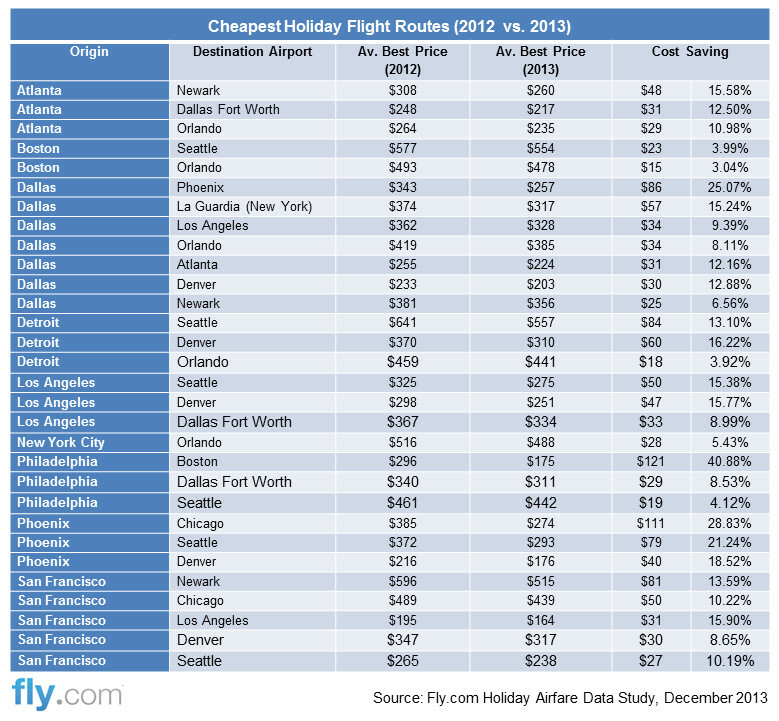 In terms of where to go, Seattle and Denver are consistently the most affordable destinations this year. Flights to both cities, which each boast nearby ski resorts, are as much as $84 and $60 cheaper (respectively). And while you can’t count on low cost airfares to popular winter hot spots like Miami and Fort Lauderdale (which are up 12.79 percent), you can still enjoy the Florida sun with various deals to Orlando. Read our table below for the best holiday deals. And remember you can always go to Today’s Best Fares to find the lowest fares from your home town.